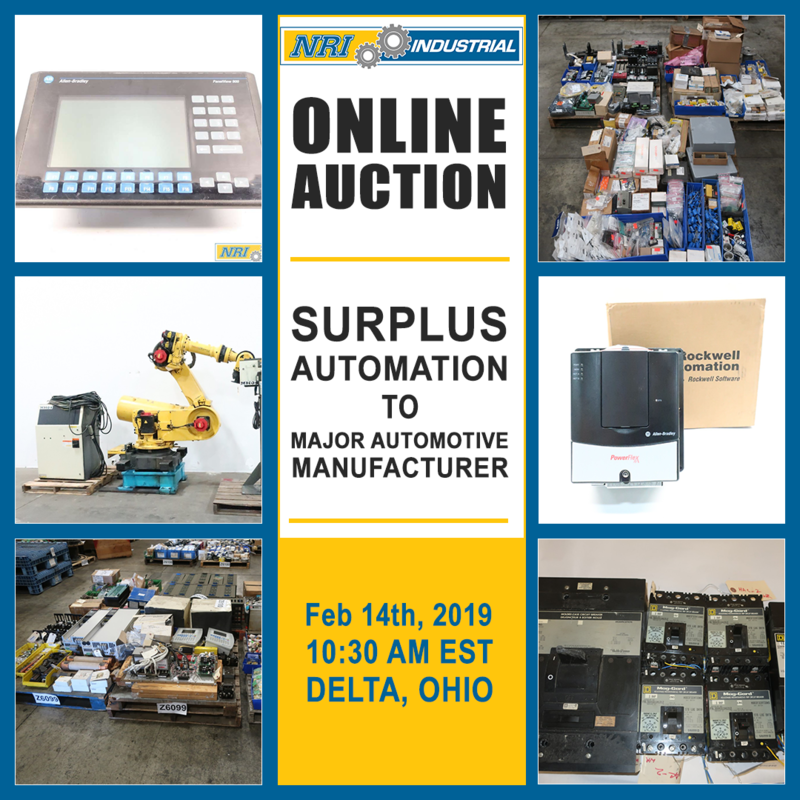 Surplus Electrical & Automation Inventory of Major Automotive Manufacturer in Delta, Ohio by Aucto Inc.
Credit Cards or PayPal. A BUYER'S PREMIUM OF 18% WILL BE APPLIED TO INVOICE IN ADDITION TO THE SALES PRICE AND SHALL BE PAID AS PART OF THE TOTAL PURCHASE PRICE. All SALES PRICES ARE LISTED IN US DOLLARS. Depending on the residence of the successful Purchaser, local state or provincial sales taxes may be charged by the auctioneer. NO WARRANTIES: All property is sold "as is" and the Auctioneer makes no warranties or representations (express, implied or otherwise) regarding merchantability, fitness, use, operation, or quality of the property and no statement anywhere shall be deemed such a warranty, representation or condition. Prospective Purchasers should inspect the property before bidding to determine its condition and quality. Each and every lot is sold by the Auctioneer with all faults and defects and with all errors of description and is to be taken and paid for whether genuine TERMS AND CONDITIONS: PLEASE READ ALL TERMS & CONDITIONS PRIOR TO BIDDING! THESE TERMS AND CONDITIONS govern the relationship between you (the "Purchaser") and NRI Industrial Sales LLC. (the "Auctioneer"). PLEASE READ THE FOLLOWING TERMS AND CONDITIONS CAREFULLY, THE AUCTIONEER WILL NOT WAIVE ANY TERM OR CONDITION CONTAINED HEREIN AND PUTS ALL PURCHASERS ON STRICT NOTICE THAT THESE TERMS SHALL BE ENFORCED. IMPORTANT NOTICE: UNLESS OTHERWISE STATED, ALL EQUIPMENT, PROPERTY, AND MATERIALS OFFERED FOR AUCTION (the "items") ARE LOCATED IN DELTA, OHIO. INSPECTION MAY ONLY TAKE PLACE IN DELTA, OHIO BY APPOINTMENT ONLY. 1. REMOVAL: Auctioneer is responsible for removal of item(s). Items can only be removed once full payment including removal costs is received. The purchaser is responsible for paying all fees associated with removal and/or dismantling. The Purchaser hereby indemnifies and holds the Auctioneer harmless against removal fees, dismantling fees and/or delayed removal not being posted or announced whether known or unknown by the auctioneer. Auctioneer shall prepare items for loading onto your transport; F.O.B. on site. Upon failure of Purchaser to collect goods within time specified as posted or announced, the Auctioneer shall have the option in its sole discretion of removing and storing the purchased items at the expense and risk of the Purchaser or may resell the purchased items without notice at public sale or otherwise dispose of goods at the sole risk and expense of the Purchaser. The Purchaser shall remain liable for any losses, expenses and damages arising from the Purchaser's failure to make payment or to obtain the purchased items within the time specified by the Auctioneer. The Purchaser hereby indemnifies and holds the Auctioneer harmless against all losses, damages, expenses, including legal fees and transportation expenses arising directly or indirectly from the Purchaser's failure to make timely payment or to pick up purchased items within the time(s) specified by the Auctioneer. 2. IDENTIFICATION: All potential Purchasers are required to register prior to becoming an "Approved Purchaser". All Purchasers are required to give their full name or business name; permanent street address (P.O. Boxes will NOT be accepted or approved); phone number(s); email address, valid credit card and website, if applicable. The information collected by the Auctioneer shall be used for the purposes of verifying identity of the successful Purchasers on certain lots of items, to enforce the terms of the auction, and for collection measures on failure to pay or to pick up purchased items on the part of the Purchasers. The auctioneer complies with relevant privacy legislation. 3. DEPOSITS AND PAYMENT: All Purchasers outside of North America will be required to pay a deposit of $1000.00 USD as part of the registration process. The deposit will be refunded in full if the Purchaser is not the successful winner to any lots. If the Purchaser has won equipment the deposit will be applied to the final invoice and the Purchaser will be required to pay the difference if a balance remains. Full payment is due within 24 hours of receipt of invoice. Only wire transfer, credit card and PayPal are accepted payment methods, NO CASH will be accepted. Additional payment processing charges may apply for invoiced paid via nd authentic or not and no compensation shall be paid for same. Purchase price will include appropriate sales tax from each state that the Auctioneer has a facility in, currently this includes Ohio and New Mexico. The Purchaser shall indemnify and hold the Auctioneer harmless against any incorrectness, error, or imperfection not noted in the online catalogue whether known or unknown by the Auctioneer. No deduction will be allowed on damaged articles as all goods being exposed for public exhibition are sold "as is" and without recourse. 5. COMPLIANCE WITH TERMS OF SALE: In default of payment of the purchase price in full within the time therein specified, lots not paid for and removed within the time allowed herein may be resold at public or private sale without further notice (by the auctioneer), and any deficiency, together with all expenses and charges of resale including legal fees, will be charged to the defaulting Purchaser. 6. RIGHTS RESERVED: The Auctioneer reserves the right to reject any bid. The highest Purchaser acknowledged by the auctioneer will be the purchaser. In the event of any dispute between Purchasers, or in the event of doubt on the part of us as to the validity of any bid, the auctioneer will have the final discretion either to determine the successful Purchaser or to reoffer and resell the article in dispute. If any dispute arises after the sale, the Auctioneer's sale record is conclusive. The Auctioneer further reserves the right to withdraw any item(s) at any time before or after the actual sale. 7. OWNERSHIP: All items become the sole responsibility of the purchaser immediately at the expiry of the time allotted for the item. Although the Auctioneer will exhibit reasonable care to safeguard purchases, until removed by purchaser, no refunds or adjustments will be allowed for any shortages. If you believe you are entitled to an adjustment to your invoice due to missing or damaged item(s), you must report the problem to the Auction Coordinator. Once the equipment has left the building, there will be no adjustments. If for any reason whatsoever a purchased item as bid cannot be delivered within that period of time of delivery provided for at the sale, the Buyer expressly waives any liability on the part of the Auctioneer and further agrees that any obligation with respect thereto shall be limited to the bid and paid for price for said purchased items. 8. PERSONAL AND PROPERTY RISK: Persons attending during exhibition, sale or removal of goods assume all risks of damage of or loss to person and property and specifically release and indemnify the Auctioneer from liability therefore. Neither the Auctioneer nor its principal, consignor, agents, employees, directors, or officers shall be liable by reason of any defect in or condition of the premises in which the sale is held. 9. BUYER'S PREMIUM: Buyer's premium applies to all purchases in the amount stated above. 10. RECORDS: The record of sale kept by the Auctioneer will be taken as final in the event of any dispute. 11. BIDS: The Auctioneer shall serve as regulator and arbitrator on all matters relating to bidding. No bidder may retract a bid. 12. THE BUYER does hereby assume and does agree to indemnify and hold the Auctioneer and Seller harmless from any future claim, which shall pertain to the fitness or use of that asset as being purchased. 13. PACKAGING AND HANDLING: All pallets will be shrink wrapped and secured as seen on the auction website free of charge. This will not include pallet amalgamation and additional packaging. A fee will apply for any request for pallet amalgamation and/or additional packaging. 14. SHIPPING: The Auctioneer will contact the Purchaser for shipping arrangements ONLY when the equipment has been paid in full AND the auctioneer has completed preparing the items for shipping. All pickups are by appointment only. The Purchaser will be responsible for providing all shipping related documentation to the Auctioneer upon being notified that the purchased equipment is ready for delivery. All items must be picked up within 7 business days upon being notified that equipment is ready for delivery. The Auctioneer will regard the equipment as abandoned if Purchaser fails to retrieve the equipment after 7 business days. 15. DISMANTLING: The Auctioneer, unless announced or made public, will not dismantle any products or items listed in the auction. All items will be shipped as seen in the auction and/or auction photos. If announced or made public, the Purchaser is responsible for paying all fees associated with dismantling. 16. ADDITIONAL TERMS AND CONDITIONS: Additional terms or conditions of sale may be added by Auctioneer by announcement or posted on the premises prior to the auction. DEPOSITS and PAYMENT: All Purchasers outside of North America will be required to pay a deposit of $1000.00 USD as part of the registration process. The deposit will be refunded in full if the Purchaser is not the successful winner to any lots. If the Purchaser has won equipment the deposit will be applied to the final invoice and the Purchaser will be required to pay the difference if a balance remains. Full payment is due within 23 hours of receipt of invoice. Only wire transfer, credit cards and PayPal are accepted payment methods (NO EXCEPTIONS). Additional payment processing charges may apply for invoices paid via credit cards or PayPal. All SALES PRICES ARE LISTED IN US DOLLARS. All applicable sales taxes shall apply. REMOVAL: Auctioneer is responsible for removal of item(s). Items can only be removed once full payment including removal costs is received. The purchaser is responsible for paying all fees associated with removal. The Purchaser hereby indemnifies and holds the Auctioneer harmless against removal fees and/or delayed removal not being posted or announced whether known or unknown by the auctioneer. Auctioneer shall prepare items for loading onto your transport; F.O.B. on site. Upon failure of Purchaser to collect goods within time specified as posted or announced, the Auctioneer shall have the option in its sole discretion of removing and storing the purchased items at the expense and risk of the Purchaser or may resell the purchased items without notice at public sale or otherwise dispose of goods at the sole risk and expense of the Purchaser. The Purchaser shall remain liable for any losses, expenses and damages arising from the Purchaser's failure to make payment or to obtain the purchased items within the time specified by the Auctioneer. The Purchaser hereby indemnifies and holds the Auctioneer harmless against all losses, damages, expenses, including legal fees and transportation expenses arising directly or indirectly from the Purchaser's failure to make timely payment or to pick up purchased items within the time(s) specified by the Auctioneer.